Justin Trails Resort is a pet’s paradise! We delight in sharing our resort with pets and all of the accommodations at our Wisconsin bed and breakfast are dog friendly. Choose from our farmhouse suites, cottages, or log cabins which offer great amenities including cozy fireplaces, whirlpool bathtubs, and private porches. We have plenty of space for your dog to run free and play away from the compound where they need to be on a leash. Check out our on site activities and trails! Our Siberian Husky Heidi will be here to give them a warm welcome, and possibly a play date, as well as our llamas Dusty & Rusty who love to be hand-fed. Our 200 acre Certified Organic Farm with grassy mowed trails and meadows is wonderful for off-leash fun. Pets may stay with you in any of our suites and cabins for an extra $35 per pet/day. There is no additional charge for pets when you camp. We have no breed or weight limits, all well-behaved social dogs are welcome. 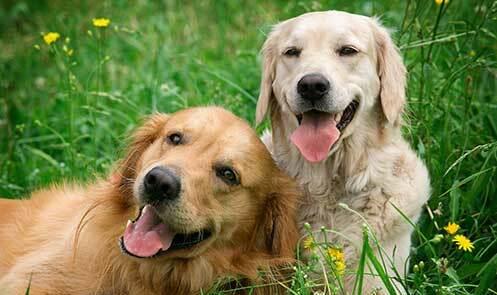 Dogs need to have current vaccinations and be dog sociable. When packing, bring your pets’ favorite food/water dishes, blanket, toys, extra leash, food and bed or crate. We expect that your dog be protected for kennel cough, etc., the same as if you boarded your dog at a kennel. Please have your pet groomed before bringing him/her. Please, no marking territory on shrubs. We take pride in and put a lot of work into our gardens. We have pet towels specifically for your pets in a basket in the Lodge. Please keep your dog on a leash around the buildings. No matter how friendly, some folks are uncomfortable with any dog. Your pet may be unleashed away from cabins and buildings. Justin Trails Resort is best enjoyed off-leash! The corn fields located near the yellow house and the woods near Paul Bunyan belong to our neighbor. Please do not go in their cornfields or woods. Please “pooper-scooper” pick-up after your pet & deposit bags in the green Waste Management dumpster near the white shed. Please do not deposit poop bags in 5 gallon garbage cans around our disc golf courses. This poses a number of problems.